Doing the Math means owning and internalizing an understanding of your numbers. Your numbers tell an important part of your story. Doing the Math also means taking the time to simplify the numbers in a way that others – Your board, your prospects and your staff – can understand. DO THE ‘BLUE‘ MATH around your Cause and Case and Impact. i.e. How many people/families/students/patients/kids do you impact? Or how many people/families/students/patients/kids NEED this impact? DO THE ‘RED’ MATH around your Staff, People and Operations. i.e., What are the people or operational costs associated with delivering your current or desired impact? And DO THE ‘GREEN’ MATH around your Income, Funding Plan, Goals, etc. i.e, What is your total need for the year or next 1,000 days based on the BLUE and RED and how will you get there? Note: Here is a list of questions you can ask your CFO or CEO to get the information you need for math. Your Gap, or even better, the cost of EXTRAORDINARY Impact. 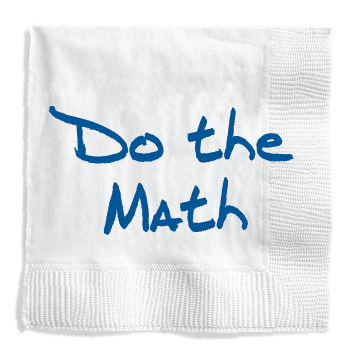 Gap math is a common way to do your math and simplify a funding rationale. I recently worked with a fantastic Hospice organization who refuses to talk about the gap and instead asks prospects to fund Extraordinary Care for every family. This Hospice has (fluctuating) revenues from reimbursements, but they don’t cover everything. This is where philanthropy comes in – For $1000 you can underwrite Extraordinary Care for one of the 3000 families they serve each year. This is a big one. Organizations frequently underestimate the true cost to deliver a program, which is essential to a funding rationale. Knowing the real numbers boosts confidence in the ask and helps the funder buy in. You can ask someone to underwrite part or all of the program. Funding a Project or Priority. This is commonly used with a ‘campaign mindset’ – projects or priorities that have a larger funding goal than some of the examples above. Casting a vision, packaging up three year Priorities or Projects and then understanding a dollar amount/funding rationale for each. For some organizations the math will be clean (like the examples above). Other times it takes a lot of work to make it simple. In writing this piece I quickly reviewed the math for 80 past clients – organizations of every shade and shape – sometimes the math took minutes and sometimes days. However, in EVERY case we were able to get some simple math around a gap, a program, the impact or a plan. It can be done. Read more from Tom about using this Do the Math principle to do 1,000 Pushups … in less than two hours!